Doesn’t time flies by so quickly in our lives? It just seems that it was just yesterday that I was hustling to go school Number 85 in Baltimore as a child. I was spending my summer days aimlessly playing from the sun up to sundown never fully comprehending the world that was exploding around me. It caught up with me the world that is when I was 14 years old and saw those military tanks and soldiers patrolling my neighborhood. They were said to be protecting us from us. Or were they simply insuring that we black people didn’t move beyond our defined urban borders? Recently I noticed a quote from Senator Cory Booker, Democrat from New Jersey that he had wasn’t born until after Martin Luther King Jr. was assassinated in 1968. Then I realized what he was saying that 49 years had passed almost since that evening in April 1968 when the bullet pierced Dr. King’s head killing him instantaneously. 49 years had passed since they killed the King. He never knew the greatness personally of Dr. King nor did Senator Booker know the greatness of these warriors of justice who died too soon but refused to bend to injustice, refused to bend to oppression, refused to allow hatred to fester in their souls. Will we remember only that man with the dream? Will we not the remember the men who also were prepared to pay the ultimate price to expose the white man’s scheme of continued bigotry? Also hard to believe that 62 years ago three black Americans was murdered victims of the hatred and deviltry of an evil nation. Reverend George Lee who was encouraging his parishes to exercise the right to vote. His voice was silenced on May 7, 1955, George Lee was 51 years old at the time of his murder with nary of a whisper of remorse from the state of Mississippi or of the men who did the murderous deed. In August simply because some retarded white savage heard a whistle, thought he heard a whistle coming from Emmett Till, age 14, on August 28, 1955. Emmitt Till was mutilated beyond human recognition by some beasts of hatred for that supposed whistle. Now we know that the whistle never occurred but the terroristic killing of Emmitt Till was no fantasy, it was a reality. No one paid a price for this vicious act just Emmitt Till who was punished that night. Of course on Christmas Day, 1955 the attack dogs of racism reared their ugly heads and blew Harry T., age 46 and Harriette Moore, age 49, to smithereens for simply being black and committed to working to gain black people’s civil and voting rights. 61 years plus 14 years is the average life expectancy for a black person living in America. Wow, pretty soon no person born the year these murders happened will be living in America. Will we as a people allow our own history to be swept under the rug of ignorance and convenience? Can you believe that September 15, 1963; 54 years have passed since that bomb exploded at the 16th Street Church in Birmingham, Alabama? 54 years since those 4 little girls, ages 14, 14, 14, and 11 were torn to bits by a sinister plot to foil human justice. Earlier that year on June 12, 1963, while going into his home Medgar Evers, age 37 who assassinated in the driveway of his home in plain sight of his family by a despicable human being dishing rage and hatred. It has been 53 years since those deeds of injustice. That on June 21, 1964, James Chaney age 21, Andrew Goodman age 20, Michael Schwerner age 24, was savagely murdered by racist thugs, oh yeah they indeed were thugs. Their bodies covered up in an earthen dam to rot. Has it almost been 52 years since that savage event? Will we as people allow neglect and disinterest to evaporate these sacrifices to be blown away like sand during a stiff breeze? So now stepped a little deeper into the abyss of our history, Jimmie Lee Jackson, who was an army veteran only 26 years old when he was killed in Selma, Alabama on February 18, 1965, protecting his mother against the onslaught of an outraged authorized government storm trooper. t was 51 years ago when those two bullets pierced his stomach sending Jimmie Lee Jackson, age 27 to glory 52 years ago. Wasn’t a magnificent warrior for justice fearless and defiant, only 39 years young murdered 3 days later on February 21, 1965, at the Audubon Ballroom by agents of a repressive government masquerading as Muslim followers? These Americans who conspired to continue on delivering oppression to people of color in this nation. Those agents of hate knowing that Malcolm X’s voice and actions would be a deterrent to any implementation of those vicious plans of continued injustice. Wasn’t it in March of 1965 that Viola Liuzzo, age 39, a white woman was shot dead simply because she had a conscious and couldn’t stand to see injustice continue to fester like rotten fruit on the vine of oppression? That same year 1965, Oneal Moore, age 22, celebrating his appointment of an officer of the law for Washington Parish, Louisiana. He was murdered in plain sight while his black patrol officer partner was blinded by bullets from a truck filled with raging white men out seeking to provoke mayhem and destruction. Can’t believe that it has been 51 years since that incident seared the nation. Will we as a community simply forget these acts that were delivered without remorse because we neglect to learn about them? It then pushed me to investigate just a little further. Two days after Dr. King was murdered Lil Bobby was killed dead in Oakland, California while involved in a police shootout lead by Eldridge Cleaver and 10 other Black Panthers as they supposedly ambushed police officers in Oakland. Bobby Hutton had just turned 18 years old at the time. Martin Luther King Jr. had just turned 39 when he was murdered. 48 years had passed between the murders of these two men one whom never really had the chance to impact the movement Robert James Hutton was to become a martyr to the cause. While Dr. King had given more than 13 years to the cause of civil rights beginning in 1955 with the Montgomery Bus Boycott. How many years between that boycott and today can you say 61 years? Is Bobby Hutton known more today for that infamous black beret than his state commissioned murdered soul? Will we allow our history to be brushed aside? How about the assassination of 21-year-old Fred Hampton by the federal, city, and state law enforcement who were sworn to protect and serve. This December 4, 1969, act of immense brutality was meant to decapitate a growing movement of united black folks in Chicago. Do we simply forget Fred and the men and women who paid the price of their lives for the cause of freedom and justice? Then I was pressed to dig a just a little deeper George Jackson, who was one of the Soledad Brothers, a member of the Black Panther Party For Self Defense and co-founder of the Black Guerrilla Family which he started while he was incarcerated in San Quentin Prison. George Jackson was 29 years old when he was killed while unsuccessfully attempting to escape from the Marin County Courthouse with a what they say was a handgun hidden in his natural. The date of the foiled attempt and his killing August 7, 1970, 1970 damn was it that long ago 46 years already. So many other black bodies were dropped and forgotten on our struggle for basic civil rights. The reason for this post is that these are names that my daughter, her future daughter’s daughter must remember as they learn to value the contribution of our people. 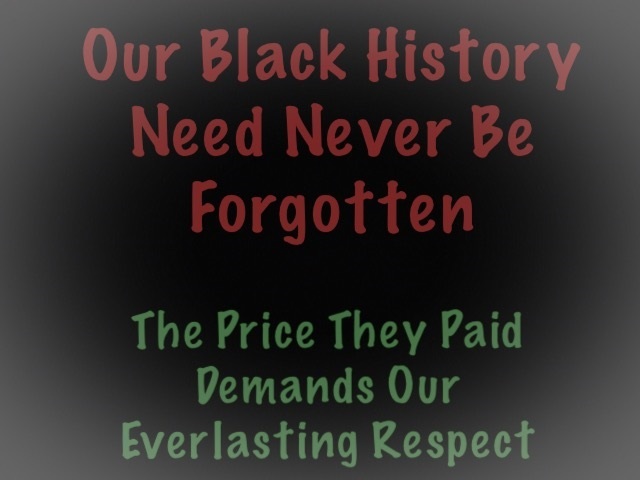 We cannot allow those who control what’s being taught to make invisible the price that our people paid for freedom. Today’s human martyrs are entirely different than those who fought for our rights. Now today’s kids have the names of Martin, Gray, McDonald, Bland, Rice, Brown, and others who were killed not directly fighting for civil rights or human rights. They were simply humans murdered because of the color line. They were victims of denied rights supposedly already provided to us after many years of struggle. nations. Will, these names carry the same historical weight as those who sacrificed life and limb in the 50’, 60’s and 70’s? Should they replace what has come before them in the minds of our young community members? No way should this happen they must be linked together as we strive for committed freedom in this nation. Will the history books define today’s martyr’s as heroes or simply victims of circumstances beyond their control? Back in the 50’s and 60’s black lives hardly mattered to those dishing injustice out in an oppressive nation. The question today seemingly remains unanswered still, do these black lives really matter? We, as a community, must understand as Septima Clark stated, “that the greatest evil in our country today is …ignorance … We need to be taught to study rather than to believe.” We must not allow any of our youth to put to sleep the sacrifices of those who fought so valiantly for what little rights we attain today. Nor should we simply kick to the curb what these individuals fought for. They were beaten, killed, maimed so that we as people could be delivered to participate in a just society. I purposely placed the ages on those who died so that the readers can understand that many choose to die for something rather than to live for nothing. It is that spirit of the principled warrior that must never be exorcized from our being. We have to remember, we must never ever forget but we must begin to build for ourselves and those that will follow. We aren’t here forever so a make it a mission to make each day a day the warrior in you stands tall. Do they still hustle to go school in cities like Baltimore as we did as children? Do they spend summer days aimlessly playing from the sunup to the sundown? Do they never fully comprehend that the world is exploding around them. Will they see military tanks and armed soldiers protecting them from themselves or are those armed agents still insuring that our children still don’t move beyond their defined borders? Will that 14 year child wakened like I did to a world he or she never realized existed? Oh yeah, that happened last April again in Baltimore you understand why we must learn our history? 47 years past between the two April for those 14 year olds awakening to the realities of a society gone horribly wrong one act enflamed by a King while the other act enflamed by a Gray. Yet both reactions fueled by the feeding of continuous injustice on a beleaguered community. You had better go ask somebody because inside each of you resides the measure of a man or woman who can build the communities these lost resting souls sought. 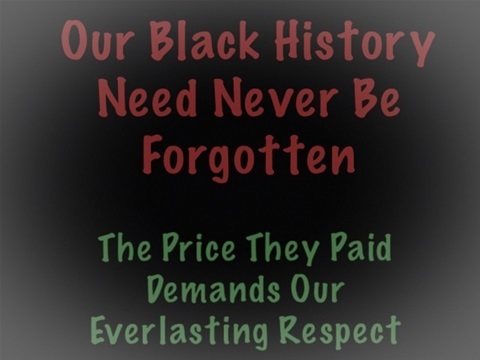 We must not allow our history to be erased whether that history occurred in 1619, 1819, 1919, or 2019 it is “our” history and only we can protect it and project it meaningfully.